Whew! Everything went swimmingly for my presentation yesterday. I appreciated the overflow crowd in OSA’s main hall. I gave a whirlwind overview of how to develop your inner artist, develop artistic skill, market your work, sell your work, and use positive energy generated from that cycle to spin the next cycle…circling back with renewed confidence and enthusiasm to further developing artistic skills. I did a demo (under the slant mirror on the stage so people could see) of laying out a limited palette of colors, mixing flesh tones, & mixing “black.” Then I did a quick painting demo of roughing-in, from photo reference I took a few months ago. I enjoyed the process more than I thought I might, and look forward to similar opportunities that might come along in the future. June 14 Presentation — You’re Invited!!! 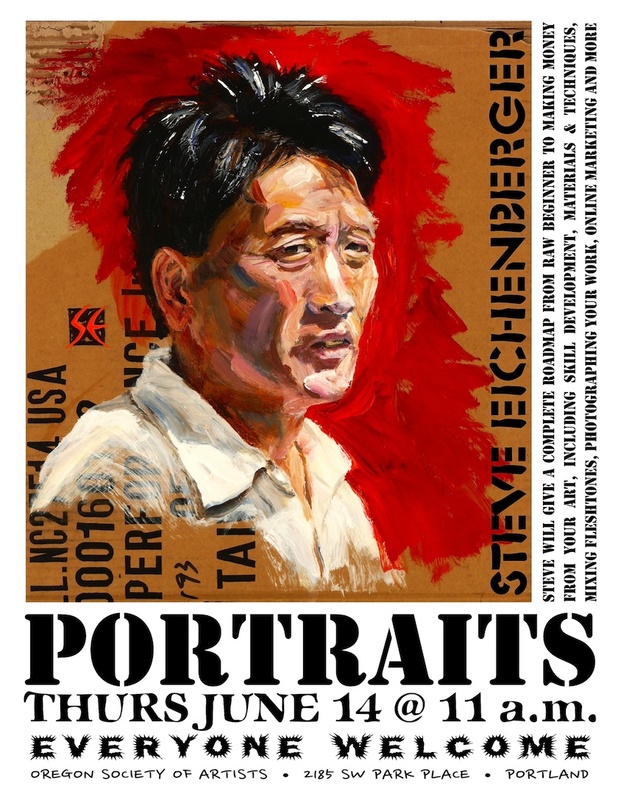 I’ll be giving a one hour Portrait Painting demo and slide presentation at the Oregon Society of Artists, 2185 SW Park Place, Portland, on June 14 at 11 a.m. Free parking. I think they’ll have a potluck afterward. You don’t have to be an OSA member to attend. As far as I can remember, this will be the first time I’ve had to speak in front of a crowd since 1977! At that rate, my next presentation will be when I’m 93, so you’d better come to this one.